SpaceCombat is an open source PC game. It's a single player space simulation. Similar (commercial) games were TIE Fighter and Freespace. 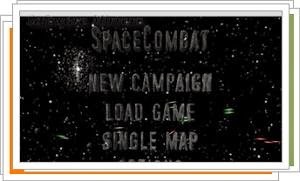 When you liked these games, you will love SpaceCombat. SpaceCombat is a space simulation game, like TIE Fighter or Decent Freespace. You can fly different space ships in several missions. Missions are connected to campaigns. It's a single player game. No multiplayer mode planned. Note, that it's recommended to play the game with a joystick. When you want to create own missions/campaigns/AI set, you should look at the documentation. SpaceCombat has a powerful scrip system implemented. So, you can create missions with a complex story. The same system is used for the artifical intelligence (AI) of all other ships.